Autumn Pumpkin Art with a Twist! Fall is an amazing time of year and nothing is more iconic to fall than the pumpkin! The name pumpkin originated from the Greek word, “pepon”, meaning “large melon” but the pumpkin itself is believed to have originated in North America thousands of years ago. While a huge food staple, pumpkins also became an element of décor with the introduction of the Jack-o-Lantern. Based on an Irish myth about Stingy Jack and the Devil, Irish immigrants opted to use pumpkins in the place of turnips to represent Jack’s most famous lantern. Beyond the Jack-o-Lantern, the pumpkin has become a core design element around the house to usher in the autumn season. 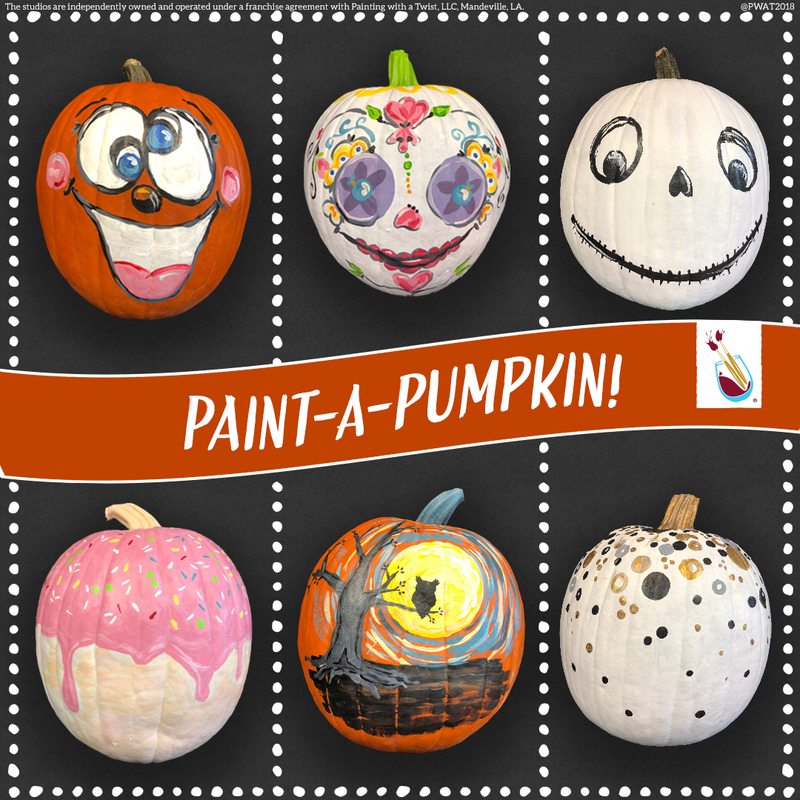 At Painting with a Twist, we honor the tradition with a variety of pumpkin art projects! We are offering many types of pumpkin art classes. Whether paintings on canvas or wooden cutout door hangers, we have something to add spice to your fall decor! Only during the month of October, you can paint pumpkins! Choose from six different styles. Our artists will guide you through the process so you will have a unique pumpkin to take home with you! Find a studio where you can celebrate pumpkin season. Summertime is one of the most highly anticipated seasons of the year. From going to the pool or beach to spending time with friends, there are so many things that we look forward to doing when school is out and the days are long. 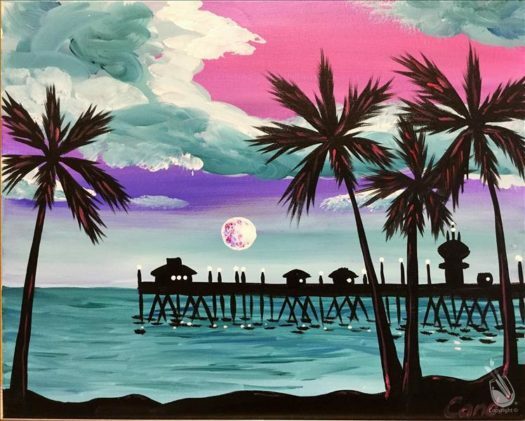 Painting with a Twist wants to help you find the perfect way to spend time with your friends and family this summer. 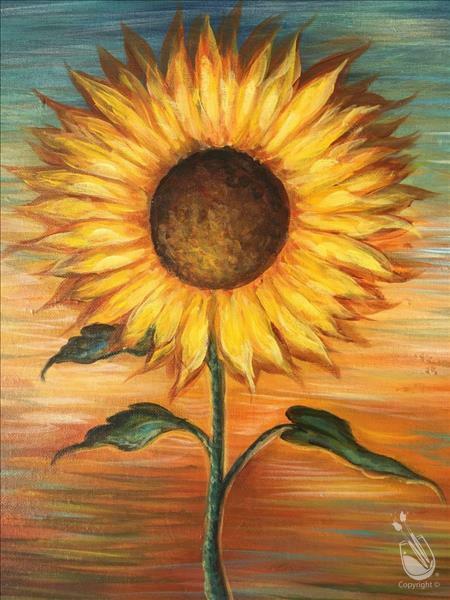 So join us, relax, laugh and have something to show for it at the end of your painting class! Technology is fantastic, and most of us couldn’t go a day without our phone or device. 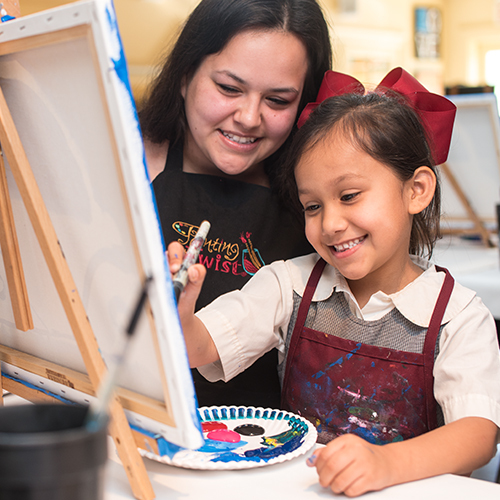 Put down the phone and go to a painting class to spend time together laughing and having fun. 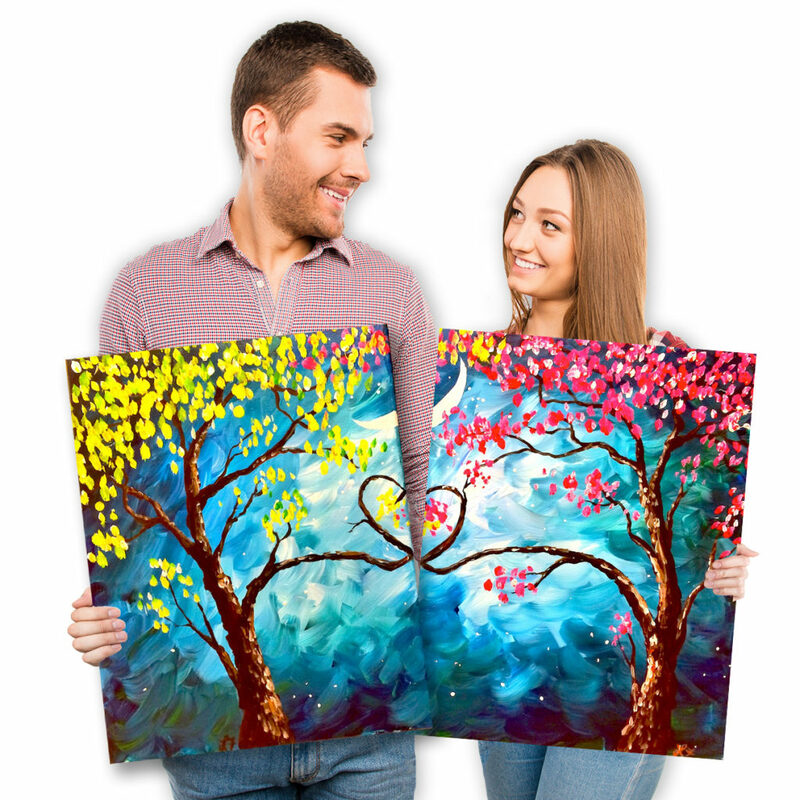 For friends, couples or families, painting is a great bonding activity. Here are some suggestions on how you can to celebrate summer with your favorite people. Need a night out? Plan a Girls Night. 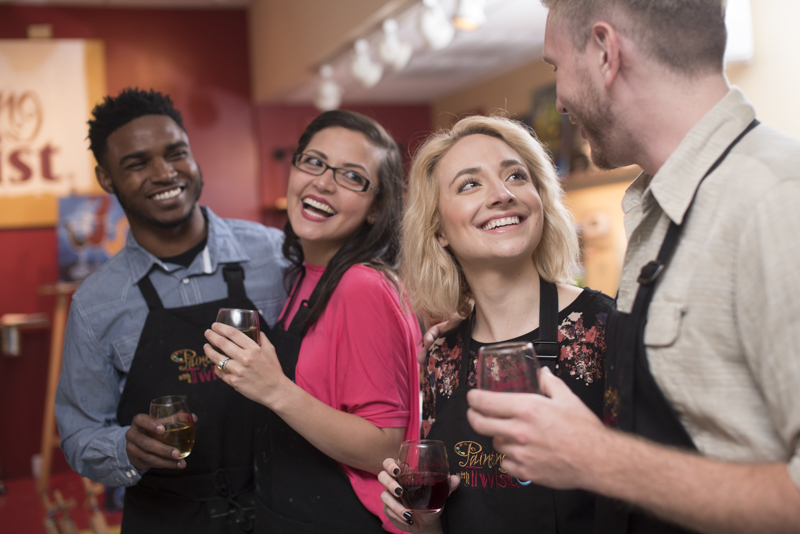 Whether a group of teachers celebrating the end of the school year and the beginning of summer or gal pals looking for a fun night out, a painting class has it all. 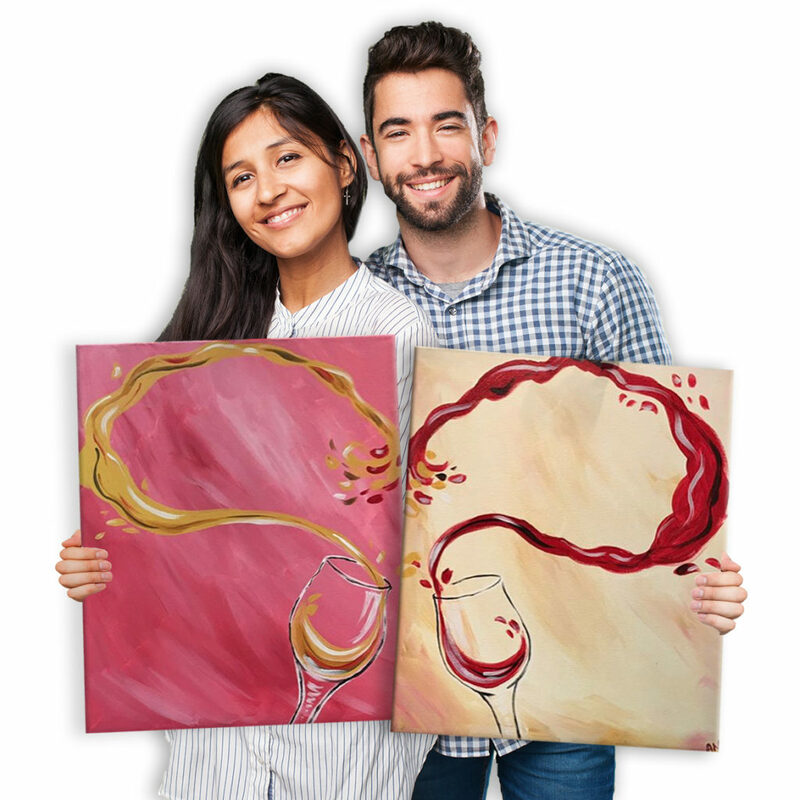 Enjoy a favorite beverage and each other’s company while you paint something to decorate the classroom for the next school year or something to hang in your home this summer. Date night is a great way to do something different with your significant other or someone new. It will give you a chance to see a different side of the person while showing something a bit different about yourself. Better than dinner and a movie, because at the end of the night you will have gotten a chance to really interact and have something to take home to remember the evening. We provide you with everything you need. 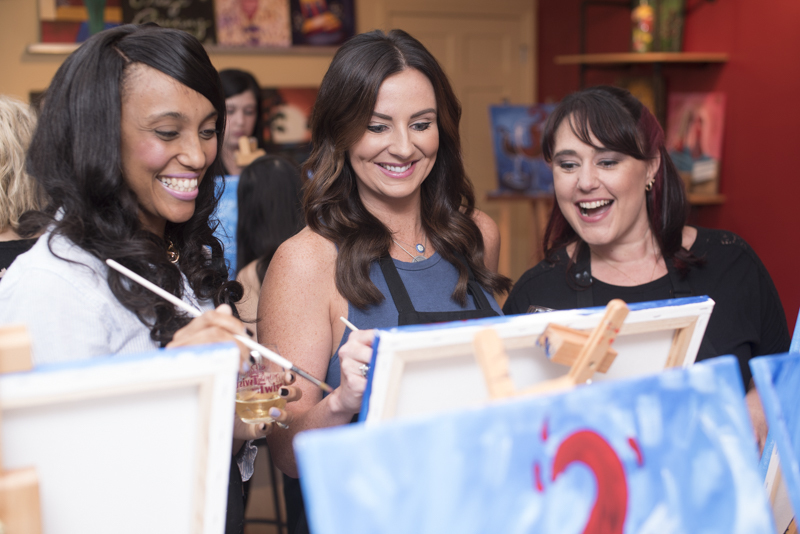 Unwind with your favorite beverage, a canvas, and paintbrush as you enjoy time with friends. Find a studio where you can let go and paint your summer fun. To Paint for Dad or to paint with Dad? That Is the Question. Let’s be honest. Dads get a little less attention on their special day than mothers (rightfully so). Father’s Day is probably just a little more significant than Grandparents Day on the, “Most amazing holidays” scale. So, we want to pay a little homage to the fathers out there who may be feeling a bit neglected on their special day of the year. A Father’s Day gift is hopefully not that impulse buy as you are standing in the checkout line at your local box store. Put a little bit of thought into your gift! 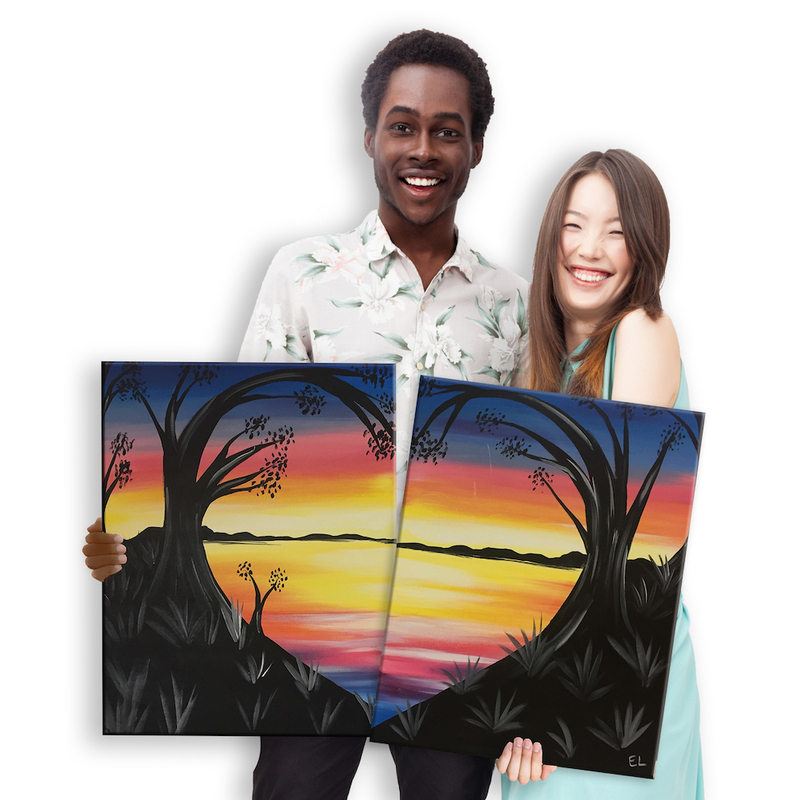 Painting with a Twist makes it easy (and fun) for you with 2 options. Paint with your Dad or paint for your Dad. Dads love getting sentimental gifts from their kids so painting FOR dad is a great option. 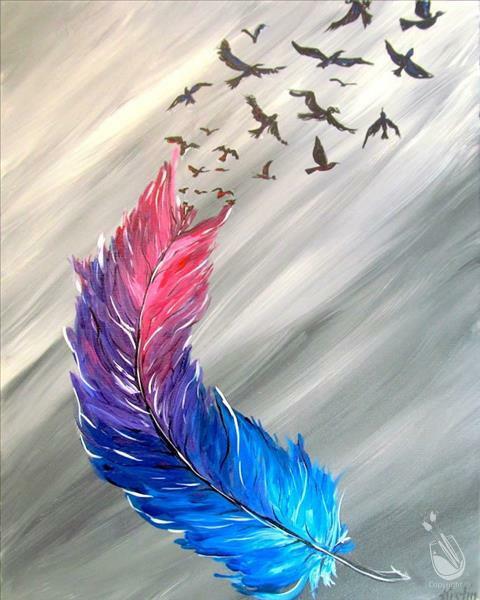 Painting with a Twist has a plethora of painting choices for you to choose from. This means you can find something your dad would enjoy hanging on his wall. 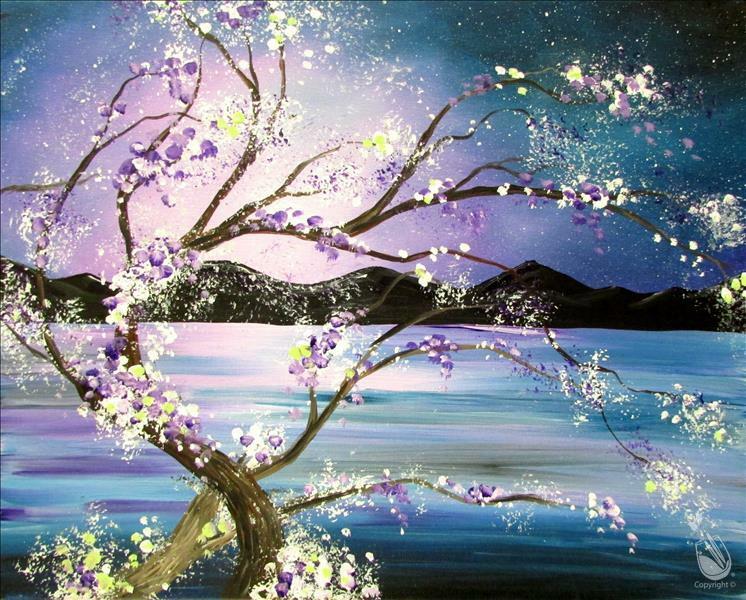 Whether a seasoned painter or beginner, Painting with a Twist classes are suited to any experience level. We supply everything from brush to canvas and even a resident artist to help guide your creativity. Check the calendar for a location near you to find the painting he’d love the most. Most dads love to spend time doing something with their kids. Something that bonds and creates memories. Painting is that exact experience and you get to take a memento (a brilliant piece of art!) home with you that will always bring back that memory when you look it. Whether you’re planning a day with dad that includes lunch, and perhaps drinking his favorite beverage or a mom planning an activity for your husband and kids, painting is a great idea! Whatever your father likes to do, we have options to suit the choosiest of dads. If you are looking for some great bonding time and building amazing memories dad will remember for years to come, then paint WITH dad. 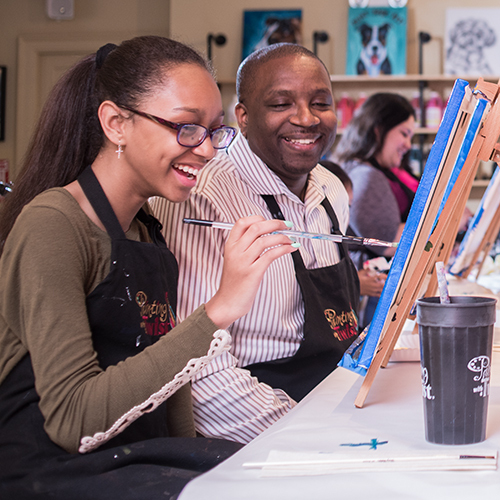 Find a studio near you and schedule some time with dad for his special day. Do something different for Valentine’s Day this year and try out a date night with a twist! 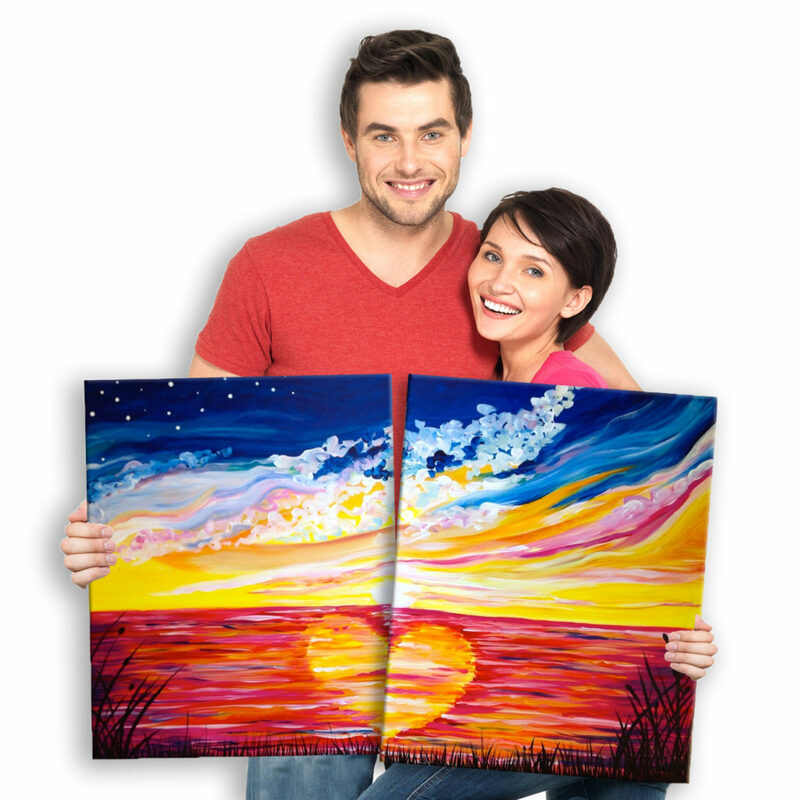 Painting with a Twist studios nationwide are gearing up for the biggest date night of the year by adding couple’s paintings to their already amazing calendars. A couples’ painting combines two separate masterpieces into one larger piece of art! Head to a studio for an unforgettable night filled with flirty games and colorful artwork. Upon arrival, you and your date will check in at the front desk and an artist will show you where your seats are. No worries, there isn’t a rush! You’ll have time to pour a glass of wine and take in the studio as the walls are usually covered in artwork. 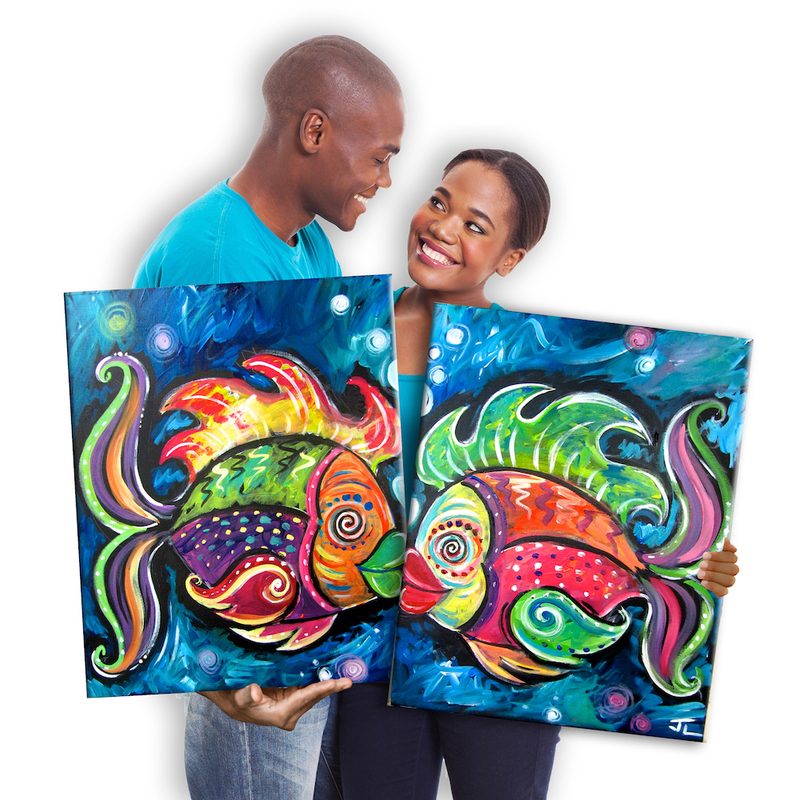 Challenge your loved one to see who can paint the best painting – winner gets a kiss! 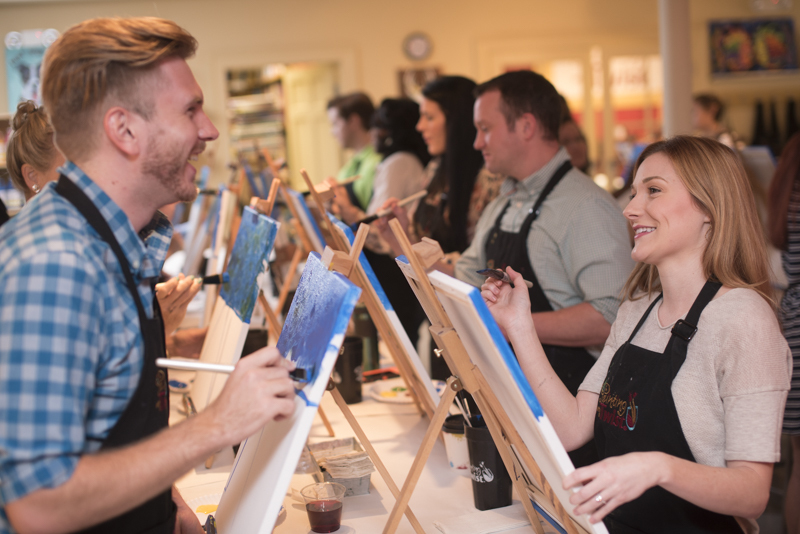 At Painting with a Twist, it’s date night done right. Painters can find the event “Wet Kiss Set” by clicking here. Painters can find the event “Love Trees at Night Set” by clicking here. Painters can find the event “Love Ripples Set” by clicking here. Painters can find the event “Love Potion Set” by clicking here. Painters can find the event “Lovely Lake Sunset Set” by clicking here. 2018 is full of creative possibilities so we’ve paired up every zodiac sign with a beautiful painting from our art library. It’s 2018 and you are ready to get up and go, go, go, Aries! Your energetic and enthusiastic mindset will love this hot-hued painting. Grab a paintbrush and get ready for these colors to invigorate your mind and soul. Painting “Pure Shores” will transport you to a vibrant bubblegum paradise. Everyone knows you are a social butterfly. You’re dynamic and lively to be around. 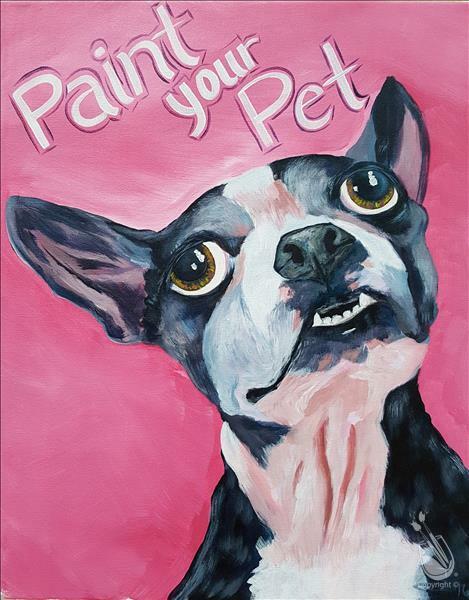 “Paint your Pet” is the most versatile class we offer. It’s perfect for the Gemini’s good-natured flexibility. Oh, deep feeling and intuitive, Cancer – You are a moon goddess at heart. Just like the that big beautiful ball of light in the night sky, you protect and look over the ones you love. “Moon River” is a painting of a full spirit like you, shining and bright. Your courageous heart is prepared to be extra fierce in 2018. 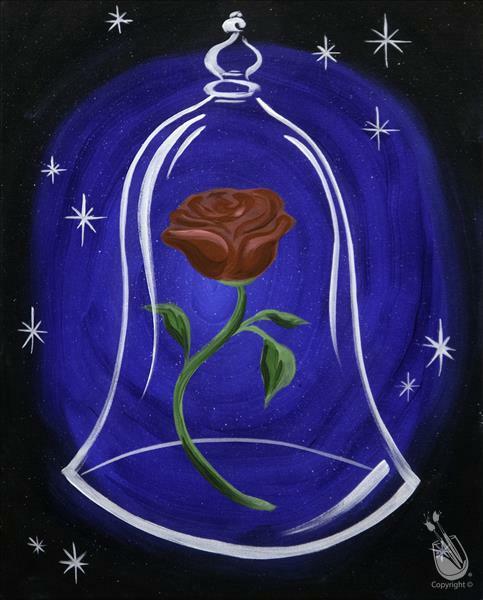 The “Rose of Love” painting symbolizes the fragility of human connection. A Leo’s kindness and emotional wisdom draw out the rose petals to reveal a bountiful blossom. Nothing sums up the fiery, passionate Scorpio as much as “Wicket Sunset.” Your intensity is a powerful calm over those you love. 2018 is going to be an exciting whirlwind of stirring up chaos then sizzling into a slow burn. 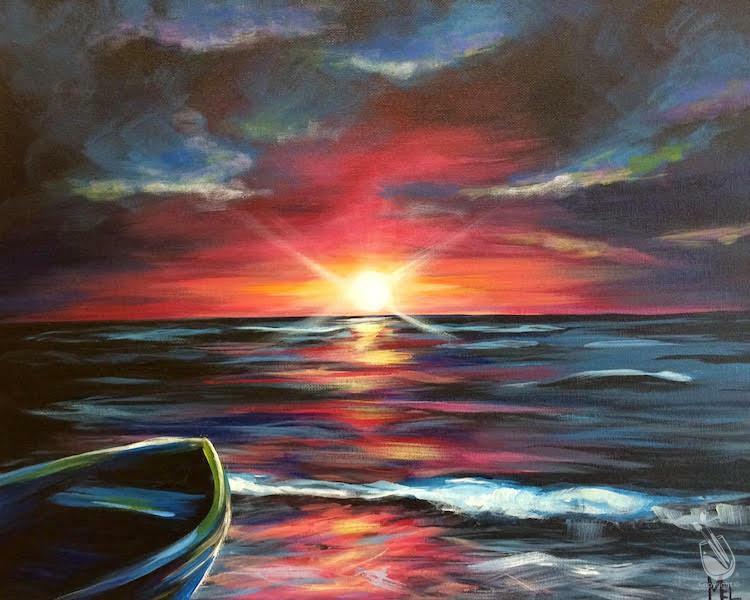 Melt into the “Wicked Sunset” with a glass of wine and a paintbrush. Sprightly Sags, you are a beauty to behold. 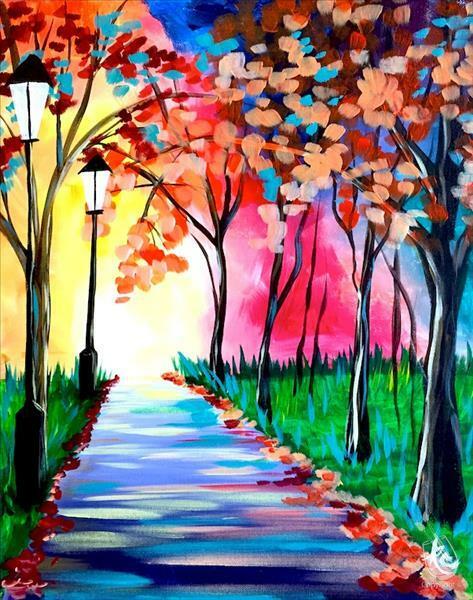 Your optimistic and forthright attitude are as refreshing as a brisk stroll which is why the perfect painting for you is “Morning Walk.” Cloak your days in color and your 2018 will be as bright as your outlook! Eccentric Aquarius is in for a good 2018. Your independence will lift you up and make you prosperous this year. Luckily for your loved ones, your friendly spirit will help them thrive too. 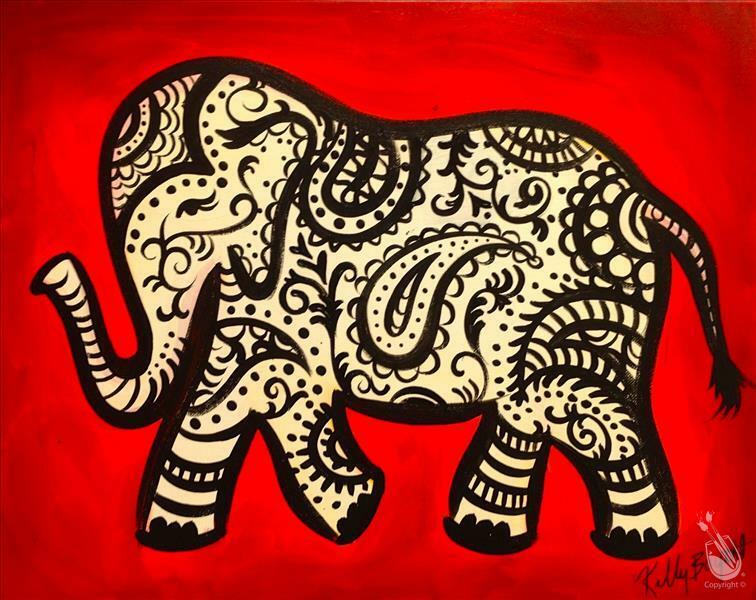 “Paisley Elephant” is the perfect painting that symbolizes the originality and strength of the Aquarius. Last, but never least, sweet Pisces. You are the most compassionate and sensitive of all the zodiac signs. Painting “Ethereal Evening” will bring about deep feelings of quiet and reflection. It is a beautifully fragile landscape of a tree cloaked in delicate flowers, overlooking a serene and distant valley. We have over 11,000 pieces of custom artwork in our art library. It’s only natural that we would have a variety of holiday artwork to delight anyone. Modern, fun, rustic, customizable, kid-friendly… you name it and we’ve got it. Here we break down some of our favorite and most popular Christmas paintings. 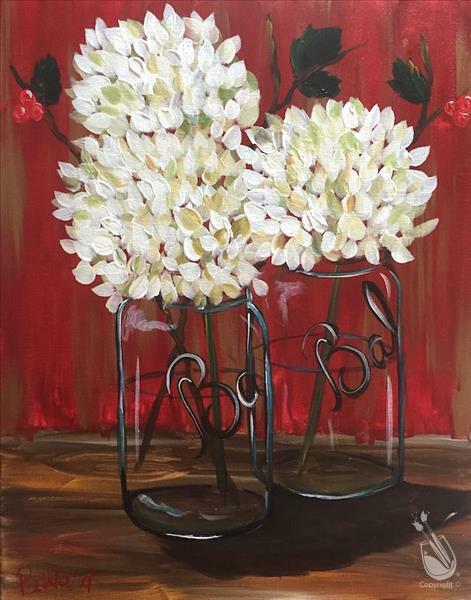 Christmas Hydrangeas is a piece of holiday artwork that came to us from the Painting with a Twist studio located in Charlotte, NC. 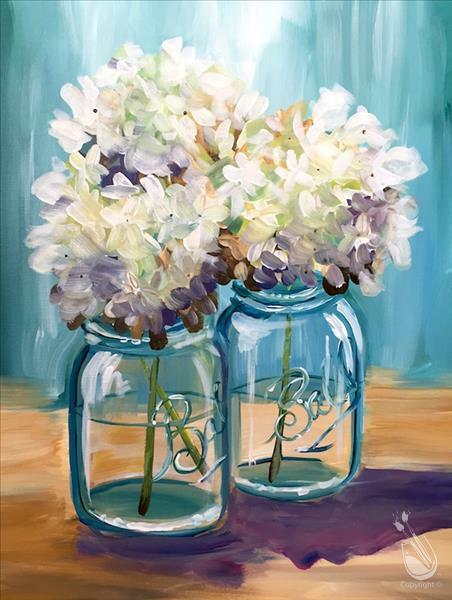 As a spin on the classic and most popular painting called “Happy Hydrangeas,” we love this one! White hydrangeas are complemented by a few twigs of holly berries in each jar. It couldn’t be cuter. If you are interested in painting “Christmas Hydrangeas” then please click here. This holiday artwork inspires a fierceness in our hearts. 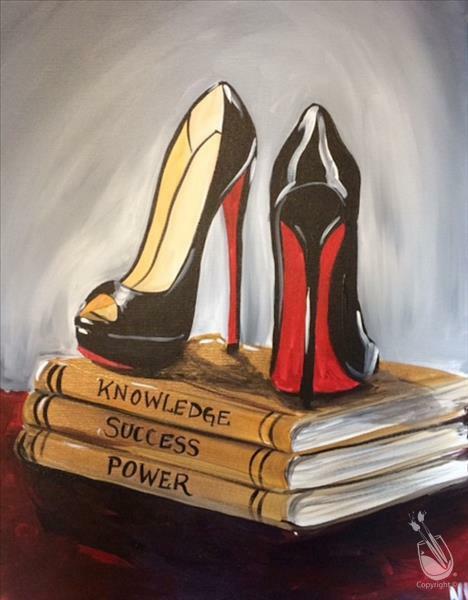 An artist from Painting with a Twist in Round Rock – Austin, TX was feeling some kind of way when they submitted this to our art library. Upon seeing it, you may already be humming a certain Beyonce song in your head. Throw on a fabulous pair of shoes, grab the girls, and pour a glass of wine at your local studio for a festive night out. 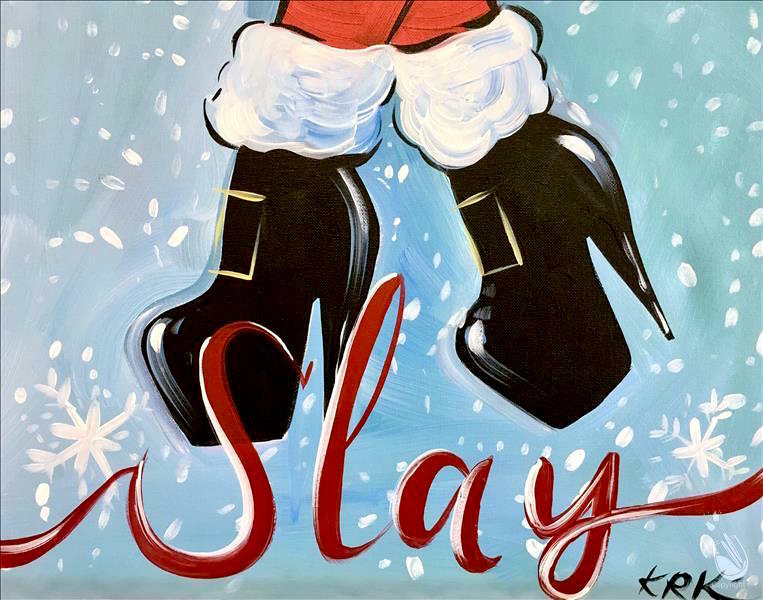 If you are interested in painting “Slay Bells” then please click here. This season’s holiday date night wouldn’t be complete without a farmhouse chic painting to go with it. 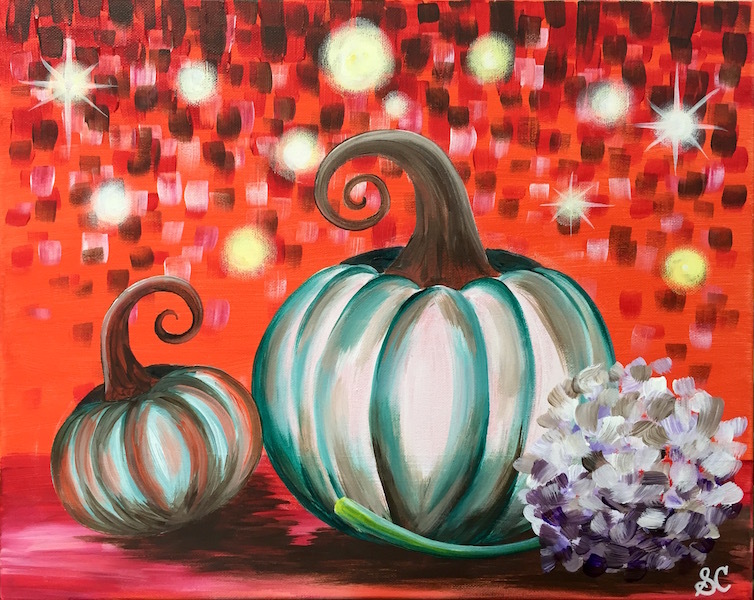 This gorgeous piece of holiday artwork was submitted by Painting with a Twist in San Antonio – The Forum, TX. “Rustic Reindeer Set” makes the perfect date night painting. Hang it as a single painting or combine the two paintings for the beginnings of a gallery wall! 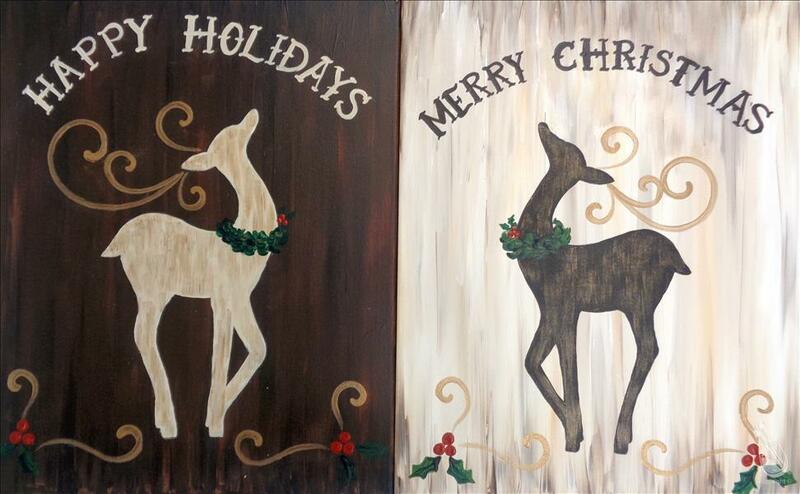 If you are interested in painting “Rustic Reindeer Set” then please click here. Cute, quirky, and customizable! This cute ornament’s playful look is sure to put anyone in the Christmas spirit. The painting is brought to you by Painting with a Twist in North Little Rock, AR. Our artists will take you step by step through the swirly letters of your initials to make sure your painting is adorable and ready to hang! 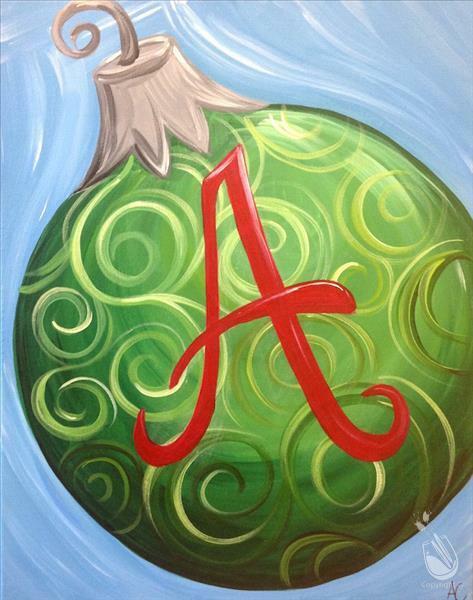 If you’re interested in painting “Fancy Monogrammed Ornament” then please click here. Painting with a Twist in Knoxville- Farragut, TN was spot on with the title of this holiday artwork. 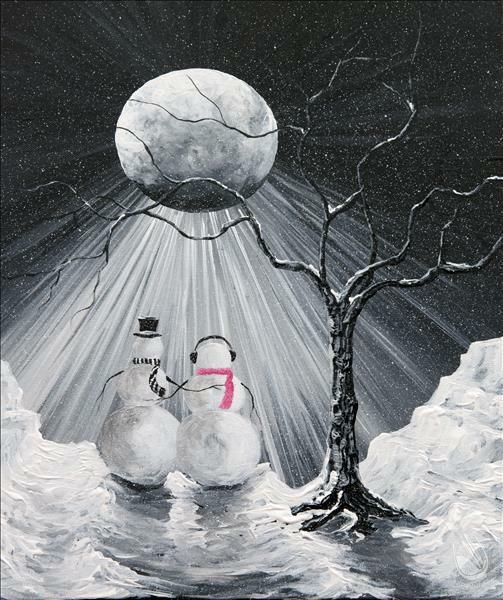 Our hearts really do melt at the sight of these two snowmen romantically basking in the snowy moon rays. The pink scarf and headphones are the cherry on top that makes this painting a holiday favorite. If you’re interested in painting “You Melt Me” then please click here. We as people obsessed with the Moon and the night sky. Why wouldn’t we be though? It’s our own personal satellite. The Moon is gorgeous in every shape – whether a big glowing ball in the night sky or a silver crescent of delicate, shining light. We delight in the moon’s reflection across a lake or the ocean… Or use the Moon’s glow to cloak our nighttime adventures when the city lights hide in the far distance. We cuddle up underneath it with a glass of wine and our loved ones, letting our hands float above our heads so our fingers can trace constellations in the sky. The Moon lies affectionately in the background for most of our memories. 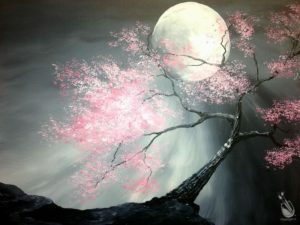 All of these reasons explain why Moon paintings are so popular in the Painting with a Twist studios. As a result, we can’t get enough Moon paintings, can you? This is a new addition of Moon art to our library. It was inspired by two other paintings in the art library called “Graffiti Aspens” and “Copper Moonrise.” There’s something about those flicks of metallic copper against that warm blue that really make this painting magical. It was painted by an artist at Painting with a Twist Colorado Springs, CO – Downtown. Customers interested in “Aspen Moon”can find the event here. Well, this inspires some dreamy feelings, doesn’t it? 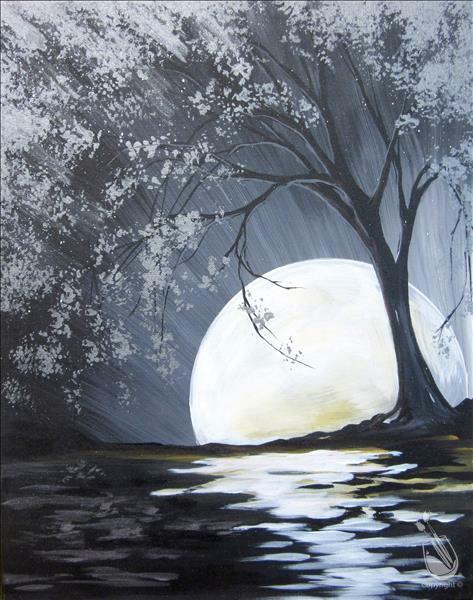 This new Moon painting is fresh from Painting with a Twist Lafayette, IN. It stirs the imagination to take flight amidst fluffy clouds, dipping and swirling into their frothy tops before coming face to face with a brilliant and beautiful full moon. Join the adventure and paint the moon. Find this event by clicking here. Talk about a crowd favorite amongst Painting with a Twist paintings. We love that pop of color against the striking moonlight. Imagine this, hanging proudly in your home. Did you know you can customize it by choosing any color you want to paint? “Wicked Moonlight” was inspired by another Moon painting called “Blue Moon” and came to us from Painting with a Twist Knoxville, TN – Farragut. Find this event by clicking here. 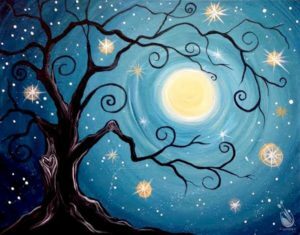 This painting is a curly, whirly take on “Wicked Moonlight.” Both of these would be sensational additions to any household – and just in time for Halloween. 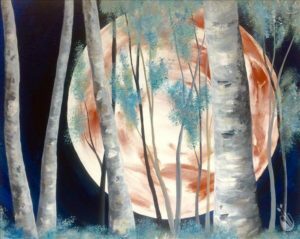 This Moon painting was created at Painting with a Twist North Little Rock, Arkansas. The artist was inspired by the twisted branches of a weeping willow tree. 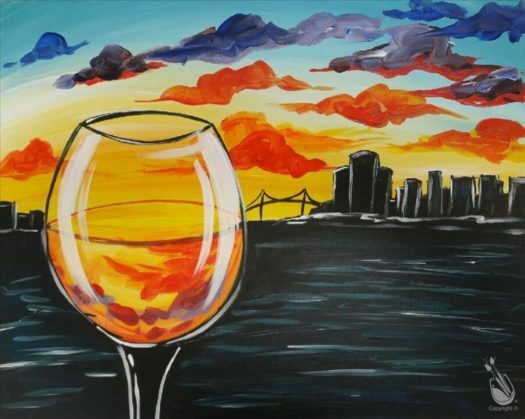 Unwind with a glass of merlot and a paintbrush. Customers can find “Twilight Wishes” by clicking here. 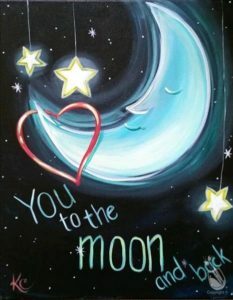 Here is one of the sweetest Moon paintings and absolutely perfect for baby. It’s a prime example of saving the best for last. First of all, there’s really nothing more sentimental than painting a precious painting for your little one. This painting is from Painting with a Twist Charlotte, NC. 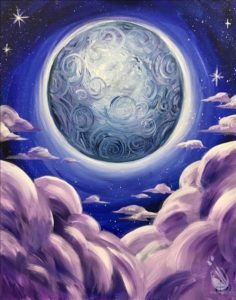 Most noteworthy, the artist who painted this says she did so for the most important reason a person can have to paint anything at all: She loves the moon. Find “To the Moon and Back” by clicking here. Well, Summer has officially come to a close. As always we’re sad to see the season go, but this was a big year for summer sunset artwork so at least we can still revel in the sunsets it offered! The dramatic sights have certainly been reflected in the artwork submissions from our Painting with a Twist artists nationwide. Sunsets in summer are so fleeting and so gorgeous that they demand each one be the most beautiful thing in the world, that is, of course until the next one comes along. 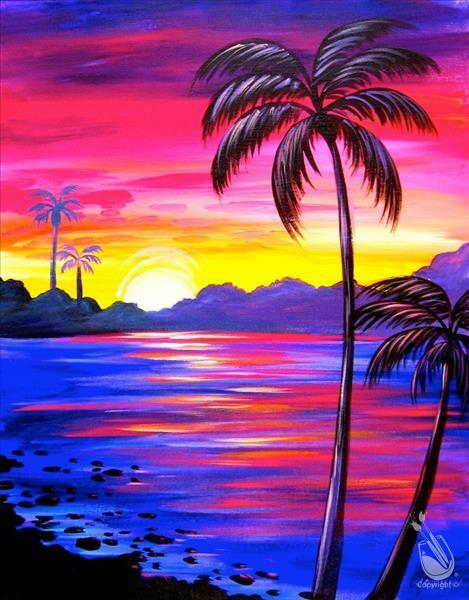 Here are some of our favorite sunset paintings from the Painting with a Twist art library. Remarkable, right? We are California dreamin’ right when we lookover this painting. It is brought to you from Painting with a Twist – Mandeville, LA but was inspired by a beautiful photograph taken in Sun Valley, CA. If you’d like to paint this stunner, here’s where to find a studio near you. This one is so sweet, so sentimental, and so striking. The colors grab you and draw you in from the start. It was painted by an artist in Painting with a Twist – Fort Collins, CO. 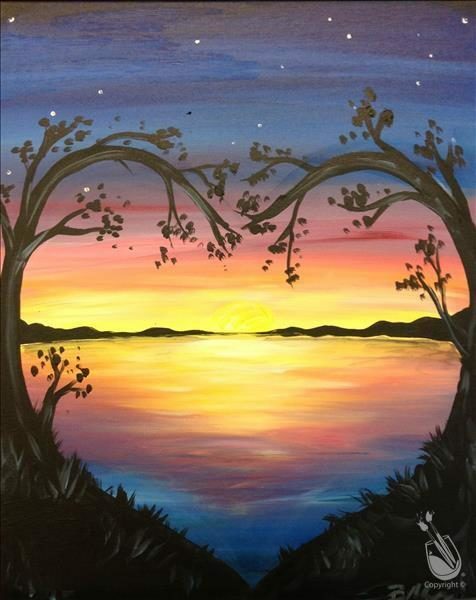 This is the perfect painting for a date night! Here are a few studios where this charming painting is available this week. Now here’s a sight we can all relate with. Stressed nerves unfrazzle just by seeing it. It’s the end of the day, shoes off, feet propped up, wine poured, and the only thing left is to let your stress drift away while you stare off into the sunset. 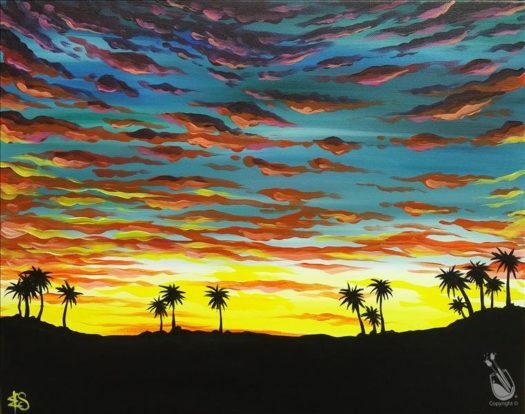 This beauty was painted by Painting with a Twist – Ferndale, MI and inspired by a similar painting we have called “Montana Sunset.” Here’s a list of studios offering this painting this week. The inspiration listed for this whimsical piece of art was, “Mermaids are the bomb!” and you know what? I couldn’t agree more. Granted, our undying wish as children was to be transformed into a mermaid, the adult-us will settle with this fabulous painting hailing from Painting with a Twist – Lafayette, IN. As one of our most popular paintings, there are a ton of studios offering this gorgeous painting in their studio. You can almost feel the crisp air in this one. The night draws near, and then sun nestles against the blue mountain crests, breaking the sky into a song of bright colors and giving the autumn foliage a run for its money. 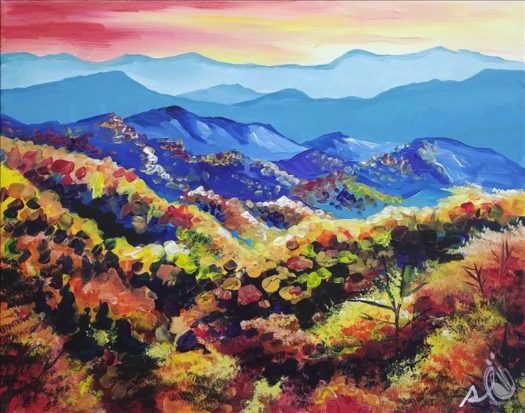 Painting with a Twist – Sevierville, TN inspired this painting so that we may all be so lucky to take in a Smoky Mountain Sunset. 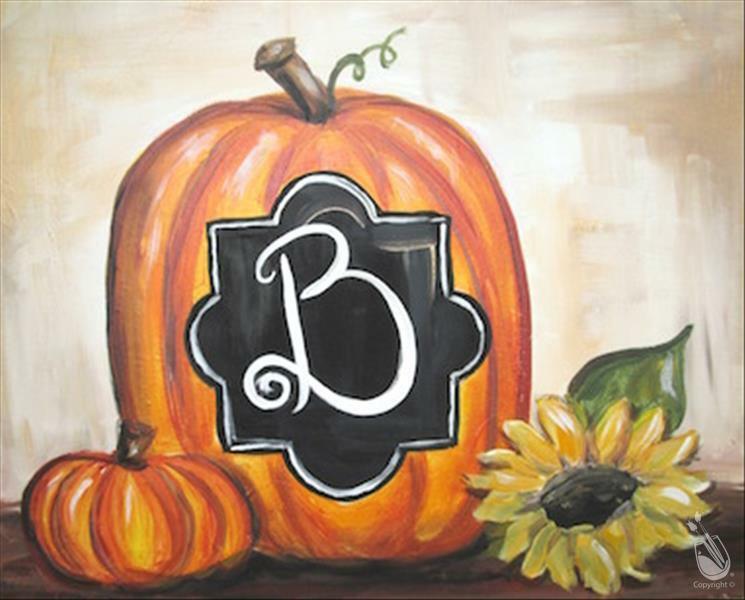 Make this painting an addition to your fall home decor today! California at its finest we might say. This sunset is straight from a storybook with that Tiffany blue and flamingo pink. There are multiple paintings of this pier in our art library but this one seems the most whimsical. 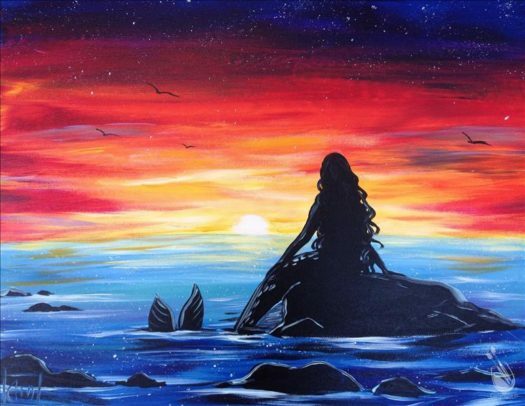 This magical painting came to us from Painting with a Twist – Huntington Beach, CA. Create your own tonight at one of these participating studios. Do you have a favorite summer sunset memory? We’d love to hear them in the comment section below.